PanARMENIAN.Net - Moscow believes that the latest agreements between Yerevan and Baku on the Nagorno Karabakh settlement will not remain on paper, Russian Foreign Minister Sergey Lavrov said Wednesday, April 17 after a meeting with his Serbian counterpart Ivica Dačić. "Following the results of the meeting of the Foreign Ministers of Azerbaijan and Armenia in Moscow on April 15, given the atmosphere in which work is now taking place, I have reason to believe that both Baku and Yerevan are interested in not keeping these agreements on paper. 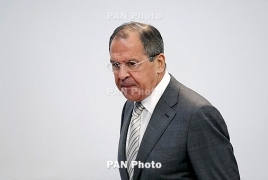 And we will support this," Lavrov said. The Foreign Ministers of Russia, Azerbaijan, and Armenia – Lavrov, Elmar Mammadyarov, and Zohrab Mnatsakanyan – held a working meeting in Moscow at the initiative of the Russian side on Monday. The co-chairs of the OSCE Minsk Group (Igor Popov of the Russian Federation, Andrew Schofer of the United States of America, and Stéphane Visconti of France), as well as Personal Representative of the OSCE Chairperson-in-Office Andrzej Kasprzyk, joined the meeting. Armenia and Azerbaijan agreed to take measures, on a mutual basis, to allow families to have access to their relatives held in custody in the two countries, according to a statement issued by the OSCE Minsk Group co-chairs.